I doubt we will see official MSAA support in Trine 3. Easier implementation for them might be some cheap Temporal AA solution like SMAA T2x which doesn't need MSAA. Is swimming still possible in Trine 3? The frog level in Trine 2 was one of the best because of that. Re: Rendering information - anti-aliasing, overheating, etc. The difference is huge in your samples and even more in motion. A 780 Ti is easily capable of 4xSSAA at 1920x1080 and is able to hold 60+ fps in Trine 2. To be honest saying AA makes no difference is nonsense. The gog version should be DRM-free. Looks quite different to the last Splot screenshots. Maybe cancelled or they restarted. A 2,5 years delay typically means they completely restarted the game from the ground on because of quality issues. And there is no sign that it could come anytime soon. So more like 3+ years. Just checked with an Intel HD4600. FXAA is broken there as well, it looks even darker. Completely broken. I reported this issue a long time ago. Nvidia fixed this Bug in Beta 320.49. I know it was already fixed for the main game from Frozenbyte itself, the demo however isn't. With the new driver even the demo runs properly now. Topic: Patch 2.0 - what's new? Re: Patch 2.0 - what's new? This option is broken. Doesn't work. FPS limited to max 100. Disabling it or even a custom fps cap has no effect. Dwarven Caverns Level? Any info on this? 320.18 WHQL is available but issue still not fixed. Topic: DRM free T2 & expansion? Re: DRM free T2 & expansion? 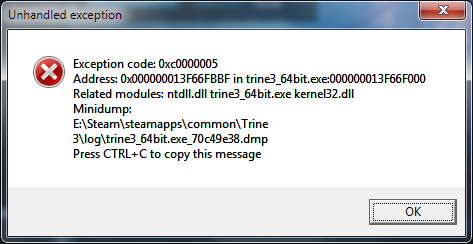 I'm sure there is a cheat/dev code to skip a level to another level in Trine 2, I can't find it anymore. What code I have to use? Well, I do find that the Windows version runs faster even at 1366*768 (which is the maximum resolution of my laptop). Exactly what I said: The performance problem might be Linux due to bad GPU drivers. GPU is your problem. Under Linux even more. Or Linux requires a faster CPU compared to Windows. Topic: is this a bug or something i don't get? Re: is this a bug or something i don't get? The Bug with the XP point, I can confirm this. But I managed to grab the XP point after some tries somehow.